Ever feel the need to transport back to a jazzier era where singing the right words and flashing the right smile amidst the flash and spectacle of shimmering sequins could put you on the fast road to success and fame? The Roaring ‘20s had it all with its speakeasies and teased hair, its flapper dancers and suave suits. And, we dare not forget about all that jazz! The intrigue, the flash, the drama! And, dare we forget to mention the fashion that walked the perfect line between classy and seductive!? 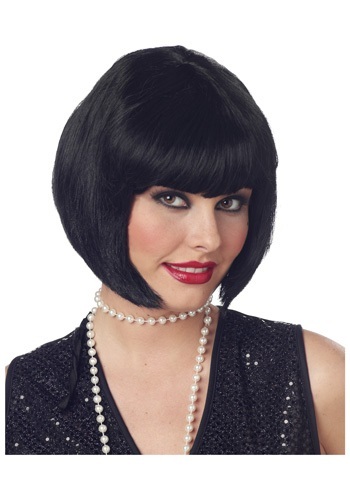 Go back to the smoky jazz clubs of the Roaring ‘20s era Chicago and feel the style and energy as the talent of their flappers leaves little competition, and do it all without worrying about a single strand of hair going awry with this Flapper Wig, a black bob cut and short bangs that will leave you knowing you can certainly do it alone!